Colour theory is the main aspect of my art I have worked on this past 3 years. Before that my work felt very flat and lifeless. I couldn’t understand why as I was shading and drafting reasonably accurately. It was after seeing some of the Impressionists’ work in person that I realised how alive they were. They looked like living scenes not paintings, yet when you crossed the room to go closer the other colours started to appear and the marks became loose. When you’re right up next to a Monet it’s just a brilliant mess of colour. They’re beautiful both far away and close up. Yet when the Impressionists painted something white, it rarely had much white on there. Their shadows were far from grey, and I could not understand how they had figured out that using these bright colours would give such realism to a painting. Until now I had never considered what the colour wheel we learnt of in school actually meant. I knew about opposite colours but how could that be used in a painting? I don’t think anyone ever spelt it out during my time in art education, and maybe I should have just known, but it has taken me until now after a lot of self educating to begin to use it in my own work. I’ve visited galleries to see the Impressionists’ work in particular up close. I credit them with most of my use of colour. One of the best group of artists for seeing how colours work against each other is the Pointillists. Pointillism branched out from Impressionism and they decided to leave all the blending to the eye by placing the dots of colour next to each other instead of mixing. 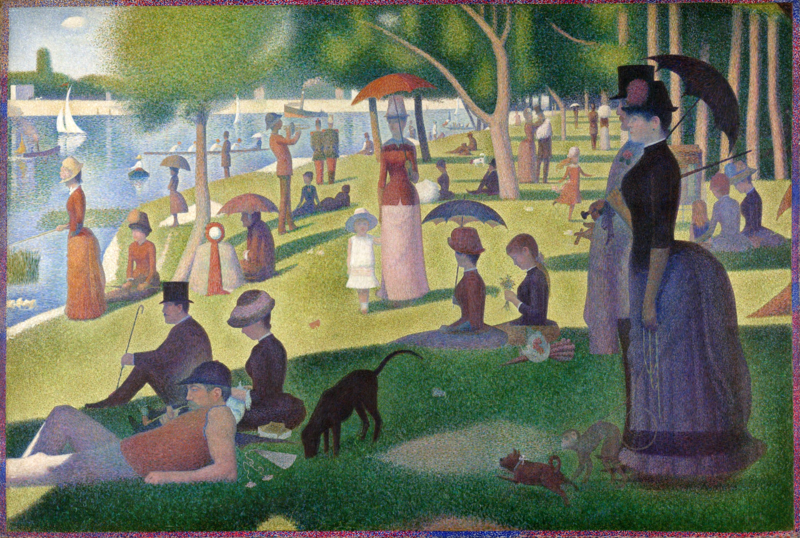 A Sunday on la Grande Jatte by Georges Seurat. you can find those opposite colours dotted alongside their partners. I’m not going to explain colour theory in this blog, but I’m going to give you some links and resources I found incredibly helpful. The influence of artists past and present has been vital to my development. I look at my fellow pastellists work online across the world constantly and find interest, beauty and inspiration from them. However, there is real importance in going back to the old Masters. So much ground has already been broken, why shouldn’t we use that as a starting point. The above video link is one of many you’ll find on Youtube demonstrating the physics of colour. I found this incredibly informative and it almost enabled me to see different colours everywhere just by knowing they actually exist and it’s not imagined. This made it all very factual and is probably a great thing to watch before going and studying any Impressionist’s work. This is a list of dozens of art documentaries from all eras and is a useful resource if you’re trying to get a good grasp of art history. I have devoured everything on this site over a period of a few years. I thoroughly enjoyed them as well as the fact that they’ve motivated and educated me a lot! I’d recommend going straight for all the series which cover the Impressionists if it’s colour theory you’re after. They helped me the most. However, once you start it’s hard to stop! I love anything by Andrew Graham Dixon which is usually on BBC. I also love a bit of Sister Wendy who has wonderful insight to the paintings she looks at in her series. Knowing how to use colour has transformed my work and my enjoyment of it too. I get slowly braver and although I’m not Impressionistic exactly, I’ve definitely picked up some great tips from their style and incorporated it in mine. I’m still discovering but getting the basics was the key. Hope you find this helpful, there are things in art which can not be taught, but colour theory is not one of them. What you do with it makes it yours, but all the info is there for the taking. Good luck! 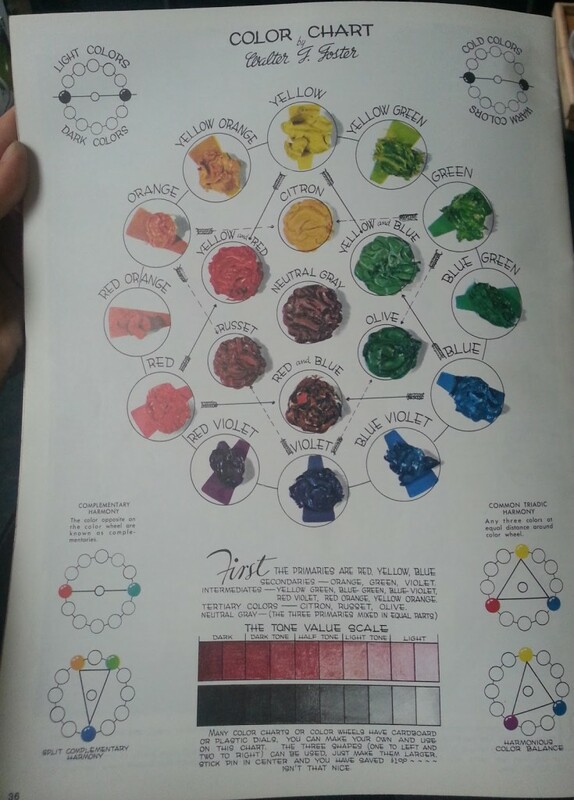 If you don't mind, would you tell me which Walter Foster book you found the colour wheel please? Hello, Emma. I was wondering if you found out which Walter Foster book you referred to? Your posts and instructional videos have been quite helpful. Thank you! Thanks Lisa! Great to get the answer :-) It was one of the best charts I'd seen!